Your congregation can address some of these very real-life concerns on any time during the year. LFL designed these materials to complement one another. We encourage using as many of these resources as possible to understand better what Living with Dying is all about. 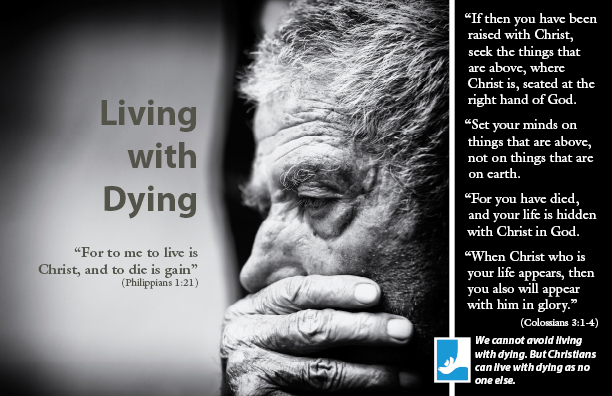 In this sermon based on Philippians 1:18b-26, Paul reminds us that as we live with dying, Christ comforts us with the certainty that it would be “far better” to depart and be with Him. But He also reminds us that the timing belongs to God. If He gives us continued life, then in His plan, it is “more necessary” that we go on living. But you see, whether we live or die we know that Christ is at work and that He will be honored. This sermon, based on John 2:1-11, the Epistle reading for the Second Sunday after Epiphany, points to Jesus as the “man of the hour” in Cana. His true hour came, however, when He was “man of the hour” on the cross. Epiphany is about making this “man of the hour” known and what His cross means as we deal with the “hours” in our lives. This sermon points to a mission field we do not always think about—the life issues. People in these difficult “hours” need to know about the “man of the hour”!